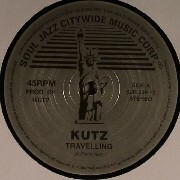 This is the SECOND of two 12" from Kutz on Soul Jazz Records. 'Travelling' is a massive party banger with a heavy rolling hypnotic bassline, this bad bwoy will be rolling through your mind all day-catchy as hell!!! But wait!.... don't forget the B side- "Static' is not one to be overlooked, massive shuddering bass bin trembler!!! !